The recent discovery of 'gravity waves' is taking the scientific community by storm. Einstein's theory of General Relativity predicted the existence of these waves, some 100 years ago. Gravity waves are essentially fluctuations in the strength of a gravitational field, caused by some type of material interaction, such as acceleration. The intensity of gravity, an accelerating force acting on 'matter', changes in a cyclical or rhythmic process, hence gravity waves. Although mainstream science has yet to make the connection between electromagnetism and gravitation, there is already a great deal of work that has been done in this regard. Electric Universe theory, the work of Dan Winter, and Dewey B Larson are all examples of research that is able to link these seemingly different forces. Dan Winter is one of the most complete, that I have seen, in so far as producing a mathematical model and documented evidence of the generation of gravity as a function of heterodyning waves of charge, where phase velocities of electrical waves generates a centripetal force towards the epicenter of charge arranged in golden mean ratio phase conjugate magnetic interactions. The point I want to highlight here is that mainstream physics assumes motion beyond the speed of light is impossible, yet they acknowledge time dilation effects of gravitational fields. And if we consider the testimony of secret space program insiders and alternative researchers, that state we have had faster than light propulsion for at least the 50 years, then clearly mainstream science is off base. 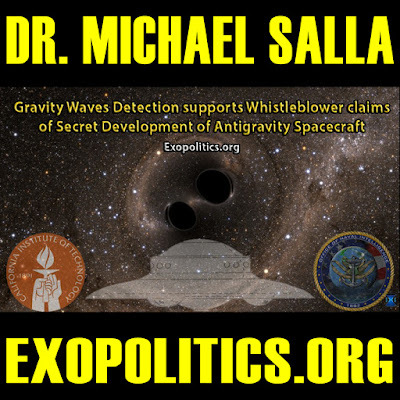 As Salla describes below, there is a long-standing history of secret space programs developing anti-gravity propulsion systems. According to Corey Goode, a secret space program insider, and whistleblower, some of the advanced craft are capable of traveling through time with ease, which at one point in the annals of the program's history, was a major problem. So while mainstream science clamor to uphold Einsteinian physics as a sweeping success, remember that this same institution denies faster than light travel and electrical interactions at macroscopic scales. When a full disclosure event finally occurs, science in general will most likely be completely transformed by what has been developed in secret and by alternative researchers. Lazar provided a W-2 in support of his testimony that listed his employer as the “Department of Naval Intelligence,” which ‘officially’ hasn’t existed since a brief period during World War II.Researchers found that the address on the W-2 was redirected by the U.S. Postal Service to Naval Intelligence Command in Maryland.